Favorable demographics, growing middle class population, large infrastructure projects in the commercial and industrial sectors as well as expanding export market have driven the growth of UPS systems market in Philippines during the past few years. Further, development of the healthcare and hospitality sectors owing to an increase in medical tourism in the country had also disposed vast business potential for UPS systems market in the country. Increasing number of data centers owing to the growing ICT sector, as well as growing number of hotels are also expected to drive the growth of UPS systems market over the coming years. According to 6Wresearch, Philippines UPS market size is projected to grow at a CAGR of 6.1% during 2018-24. Increasing use of technology across all the segments of the society such as industrial, commercial and residential sectors under the country's government plan "Build, Build, Build" and the rapidly growing demand of information and technology industry would demonstrate vast opportunity for the UPS systems market in the country during the forecast period. Additionally, the growth of transportation infrastructure in Manila and Luzon islands of Philippines along with increase in the energy demand, especially from the commercial and industrial sectors would further increase the requirement for UPS systems as a backup source of power for critical equipment over the coming years. Amongst all the applications of UPS systems, the commercial application captured the highest Philippines UPS market share in 2017. In the commercial sector, data centers, BFSI and hospitality segments were the major revenue shareholders and are expected to maintain their dominance over the coming years on account of government emphasis on developing the country's social infrastructure. 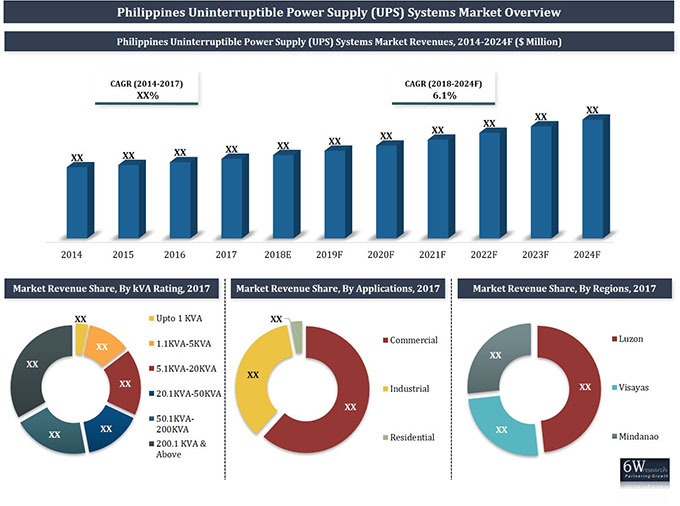 The Philippines UPS market report thoroughly covers the Philippines Uninterruptible Power Supply (UPS) Systems market by kVA ratings, applications and regions. The Philippines UPS market outlook report provides an unbiased and detailed analysis of the Philippines UPS market trends, opportunities/high growth areas and market drivers which would help the stakeholders to device and align their market strategies according to the current and future market dynamics. 13.6 Delta Electronics (Philippines) Public Co., Ltd.